Renovation Fiber-Optic Renovation Fiber-Optic perimeter lighting channel is easy to install and provides a mechanical attachment. The top flange is designed to compress when inserted into a saw cut 5/8" depth X 1/8" width. A bead of adhesive placed between the top flanges is recommended. Is this for a inground gunite pool? Does it come in clear? A Answered on 6/8/2018 by InyoPools Product Specialist Lennox H.
Hi, Elaine. Yes, this Fiberoptic Perimeter Track can be installed in an inground gunite pool. Is not available in clear. Hi, Chad. You can use the Super Vision Perimeter Track - SVTRK42. It is my understanding that this is the track that snaps into the vinyl liner bead of an existing pool. Is it possible to purchase a single length of track or obtain small sample piece to see how it works with my side-glow fiber. Tim, Unfortunately, we do not have samples. I would recommend calling Stegmeier for a sample. How long is this track and can I use it on a pre-existing pool? >The 7REN4F is 112 ft. in total length. Yes. 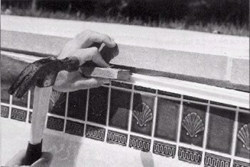 This track is designed for use in pre-existing pools.